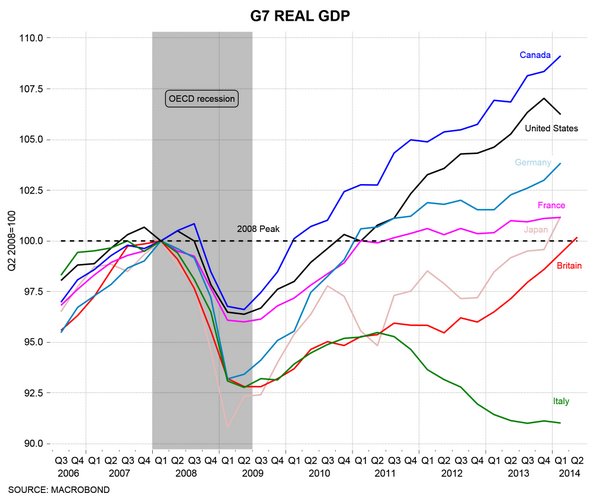 I came across this interesting graph over the weekend that shows the economic performance of the G7 countries since the financial crisis and recession of 2008. It shows that the British economy declined more sharply than any other apart from Japan, and that over the six years since then has performed worse than any other apart from Italy. I think this poor economic performance has long-term roots. For decades United Kingdom governments have pursued economic policies based on concentrating resources economically in the financial sector and geographically in the southeast. This means that many sectors of the economy and regions of the country have been constrained in their ability to achieve their full potential. The report advocated greater local devolution and a more imaginative approach by city councils. The Homes & Communities Agency announced this week that it had allocated only half of its affordable homes programme with £900million being allocated to 160 providers (many of them local authorities) with the intention that this will fund 44,000 homes. The remaining funding will be made available for providers to bid for under the continuous market engagement process. They had wished to allocate about 75% of their budget but have been unable to do this as many large developers have not submitted large bids! Similarly, the Greater London Authority has found difficulty in allocating all its resources for the affordable homes programme in London. Impact Housing Association, of which I am Chair, bid successfully for eleven units. Most providers have bid for ‘non-grant’ schemes purely so that they can deregulate their earlier Homes & Communities Agency funded stock on a one-for-one basis. Providers in high value areas will often not bother with grant as the works required to meet Homes & Communities Agency standards would cost more than the grant. They are often preferring to fund market rent housing to cross subsidise non-Homes & Communities Agency affordable schemes. In low value areas, a programme is often viable only if there is significant other subsidy or if providers have some high rent properties as part of that programme. The relationship between national and local taxation is an interesting subject especially in view of the financial plight of local authorities. According to HM Treasury, taxation in the United Kingdom increased by £134.8billion from 2009/10 to 2014/15. Of this increase, £2.3billion was imposed by local government and £132.5billion by central government. It appears that while austerity and low taxation are familiar in local authorities they are not so familiar in many parts of central government! I am also interested to see that Communities & Local Government is out to consultation on a proposal to make councils declare the value of their council housing ‘for the first time’. This surprises me because I thought that councils had always declared the value of their council houses in their annual accounts. For example, I checked the accounts for Lambeth Borough Council for 2012/13 and they state quite clearly that their council houses have a value of £1,374million. So what is the government looking for? There may be a clue in the statements of the former Minister in which he refers to the sale of high value council properties! What is the Political, Economic, Social and Technical Context of Local Authority Housing? How can we develop effective self-financed business plans in the light of government reforms to rents, right to buy and welfare; and changing approaches to the ring-fence? How can we invest in existing and new housing in the light of the ‘borrowing cap’ and the conditions for social housing grant? What can the Strategic housing services achieve? How can we get ‘value for money’ and excellent customer service? This Wednesday I will be chairing the Impact Housing Association board meeting that will be held in Penrith. The main issues on the agenda are a review of the audit committee and the development of a strategy for supporting people with dementia. Good governance and a clear evidence base to decision making. A risk based approach with a new emphasis on ‘stress testing’ (what might happen if one of the significant risks occurs). Continuing emphasis on value for money. Dementia is an increasingly important issue with the changing demographics that we are seeing and will involve ever closer working between housing, social care and health services. It is estimated that a million people in the UK currently suffer from dementia and that the number will increase to 1.7million in 2051. The UK government has responded with the Prime Minister’s dementia challenge in 2012 and the Care Act 2014. Among other things the Act places a duty on local authorities to address preventing needs, provide care and support plans and operate personal budgets. Impact Housing Association is currently developing two extra care schemes in addition to those that we already provide and are discussing a potential third. As our focus is on sustaining communities, building capacity and addressing poverty, it is crucial that we ensure that our services contain an awareness of dementia and that the communities we work in are dementia friendly. The strategic discussion at Board will look at how we can do more. Last week I completed the marking of all the Management Accounting examination scripts for the June 2014 session of the Chartered Institute of Public Finance & Accountancy’s International Public Financial Management Certificate. Congratulations to all the successful candidates! I am writing this blog while travelling to London before tomorrow’s seminar and workshop on ‘Developments in Local Authority Housing Finance’. I am looking forward to meeting the delegates who are coming from local authorities across England. Last week I presented a housing finance workshop for the Councils with ALMOs Group (CWAG) that is one of the special interest groups of the Local Government Association (LGA). The workshop was held in Islington and covered subjects including development of new council houses by councils, the operation of the housing revenue account ring-fence and Value for Money. It appeared to be well received. One of the issues that I covered for CWAG and will cover again in our Developments seminar and workshop is the need to build new council houses and the barriers that face local authorities that wish to do this. One obvious barrier is the ‘borrowing cap’ that limits what local authorities can borrow for housing purposes and in many cases prevents them from borrowing any more than the sums that the government obliged them to borrow in 2012 when self-financing was introduced. This week’s ‘Inside Housing’ reports on a web poll that asked ‘Is the best way to boost council house building by lifting the borrowing cap?’ to which 54% answered ‘yes’, 37% answered ‘no’ and 9% did not know. The Local Government Association has formerly asked the government to raise the ‘borrowing cap’ by £7billion but in the 2013 autumn statement the government agreed to raise it by only £300million and that this has ‘strings attached’. Remember, this is government giving local authorities permission to borrow at their own expense to build houses that the government wants them to build! Other barriers include the reluctance of some local authorities to borrow, public opposition to new development and the fact that it is often difficult to find schemes that ‘stack up’ financially. Some authorities are attempting to overcome these barriers, including the ‘borrowing cap’ by setting up subsidiaries and joint ventures. Impact Housing Association, of which I am Chair, has now published its annual report to members and annual report to tenants. They are both on the Impact website at http://www.impacthousing.org.uk/news/annual-general-meeting-2014 . They show an association that provides good and responsive services to tenants and other service users, that achieves Value for Money and that is ambitious and continues to grow and develop. The news is full of the fact that the National Health Service (NHS) has been 66 years old this week having been founded on 5th July 1948. Some people have celebrated by putting up websites that can tell you where you stand in the list of babies born on the NHS. Apparently I was the 8,069,929th one! It appears to me that one of the challenges facing the National Health Service today is how to work jointly with adult social care services and housing providers especially to provide support to the increasing number of elderly people who require some care. This challenge has been widely recognised for some time but progress in addressing it has been disappointingly slow. I was pleased therefore, to read in the ‘Local Government Chronicle’ that Sheffield City Council and Sheffield Clinical Commissioning Group have agreed to establish a single shared health and care budget of £278million; and to hear progress in Bournemouth Borough Council in integrating adult social care and housing services.